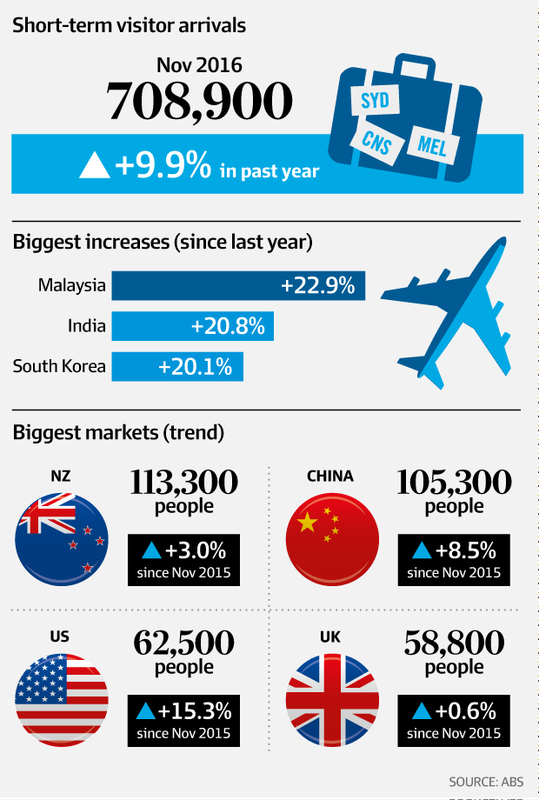 The tourism-led economic resurgence is set to continue this year with latest figures showing Asia’s infatuation with Australia shows no sign of abating. With Chinese New Year approaching later this month, the fast-growing and wealthy Chinese middle class is also propelling China towards becoming Australia’s number one tourism market, only just behind New Zealand. But it’s not all China, with the latest visitor numbers from the Australian Bureau of Statistics showing the strongest growth in the past year was recorded by other Asian countries including Malaysia (22.9 per cent), India (20.8 per cent) and South Korea (20.1 per cent). China – which has become the focus of targeted marketing by Tourism Australia over the past few years – recorded trend growth of 8.5 per cent in the year to November, but tourism industry bodies (which use the original figures rather than trend or seasonally adjusted figures) said the growth was closer to 19 per cent. Given the speed of growth, China is likely to over-take New Zealand as Australia’s top tourism market sometime this year, fuelled by visits to Australia for Chinese New Year which falls on January 28, a few days after Australia Day. Tourism Australia figures show China recorded 1.19 million visitors to the end of November, compared to 1.34 million for New Zealand. The United Kingdom was a distant third on 712,000. Tourism Australia chief executive John O’Sullivan said the figures confirmed the strength of international tourism with close to 8.2 million visitors in the year to November, up 11.3 per cent on the previous year. Increased airline capacity and targeted marketing campaigns have helped boost the inbound tourists, which have been assisted by the Australian dollar. “While the overall picture is one of good growth across the sector, there were bullish double digit increases from a number of Tourism Australia’s key international markets such as the US, China, Japan, Korea, Malaysia, Singapore and India,” Mr O’Sullivan said. While most tourism operators have been targeting the lucrative and large Chinese market, smaller Asian markets such as South Korea have also been growing at a fast rate, with spending up 29 per cent as part of a $40 billion spending spree by international visitors in the past year. Tourism Transport Forum chief executive Margy Osmond said the bumper tourism figures were achieved despite tax rises by the federal government, including an increase in the passenger movement charge to $60, and unwanted publicity on the Turnbull government’s backpacker tax. “This year must be about the government keeping its hands out of the pockets of the industry so we can reach our full potential as a wealth and jobs generator for the nation,” Ms Osmond said.